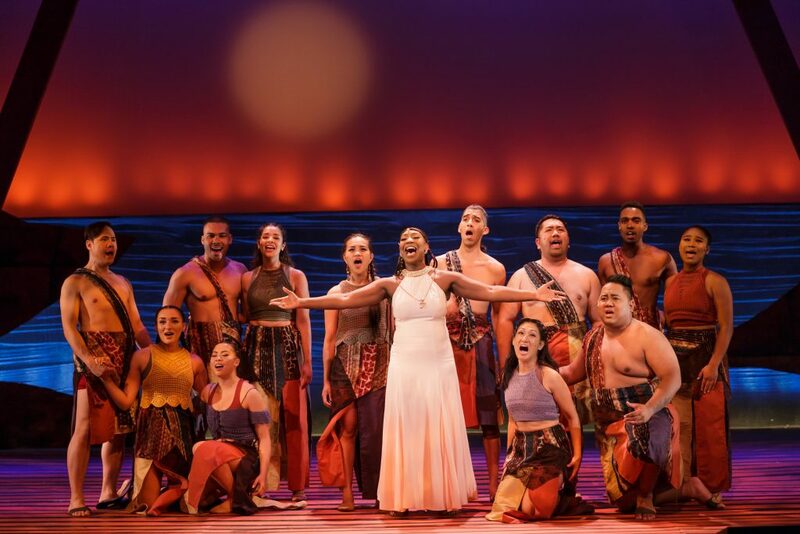 Broadway by the Bay’s “Aida” explodes with energetic performances that give me goosebumps. The ensemble’s game is tight. My eyes are glued to the brilliant dancers–Angelica Scott, Daniel Lloyd Pias, and Ali Lacer. In the Egyptian desert, Scott dazzles in “The Dance of the Robe,” my favorite number. Choreographer Nicole Helfer adds gorgeous West African dance moves to Elton’s John’s drum driven score. The Nubian slaves are celebrating their Princess Aida, pleading for her help. I screamed out with zeal when the dancer’s arms start to fly in West African style, while the poor lady in front of me looks back, quizzically. Slavery is about class not race. America’s race problem stems from greed and entitlement. 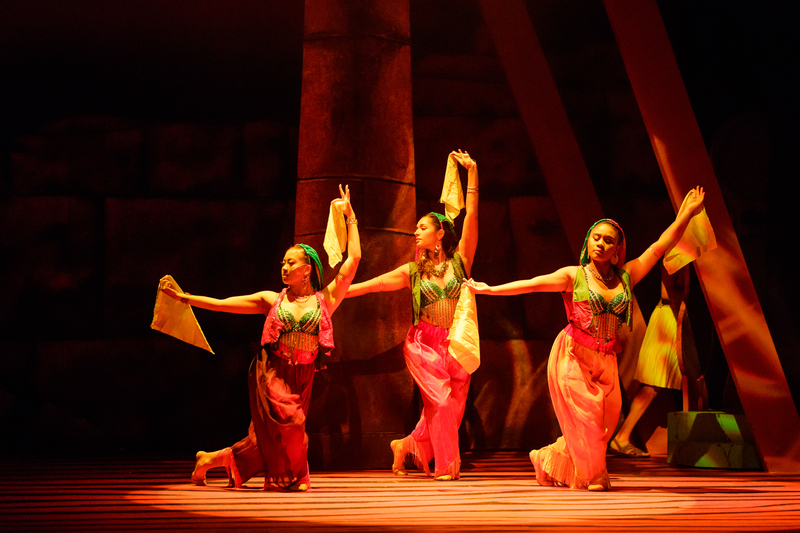 The enslaved Nubians onstage are comprised of beautiful Asian, Latina, Middle Eastern, and Black performers. Even the poorest among the Whites/Egyptians feels powerful so long as they can dominate these subject peoples. 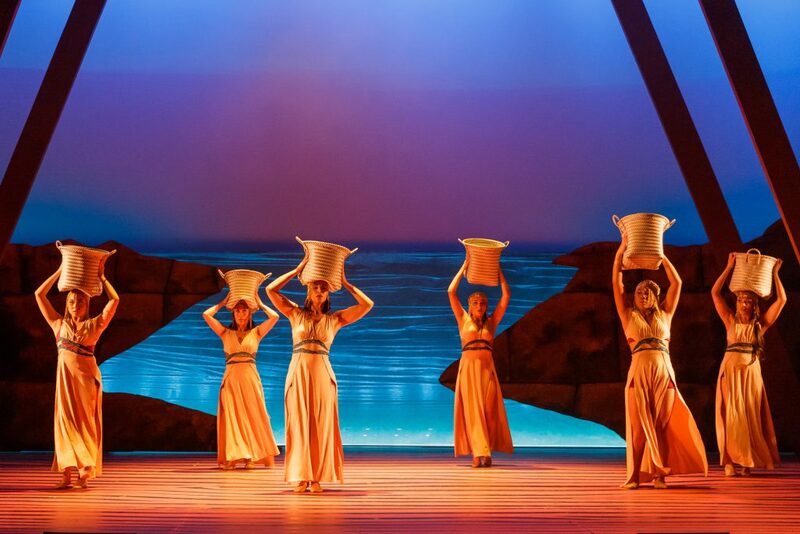 In “Aida,” the whole history of colonies and empires flashes before our eyes. Princess Aida tells her people: “Your robes should be perfect instead of ragged concoctions of thread. May you be moved by their desperate beauty to give us new life.” These beautiful lyrics reflect the history of People of Color in the U.S. and around the world. After our past and present political trauma, we will be stronger than ever before. 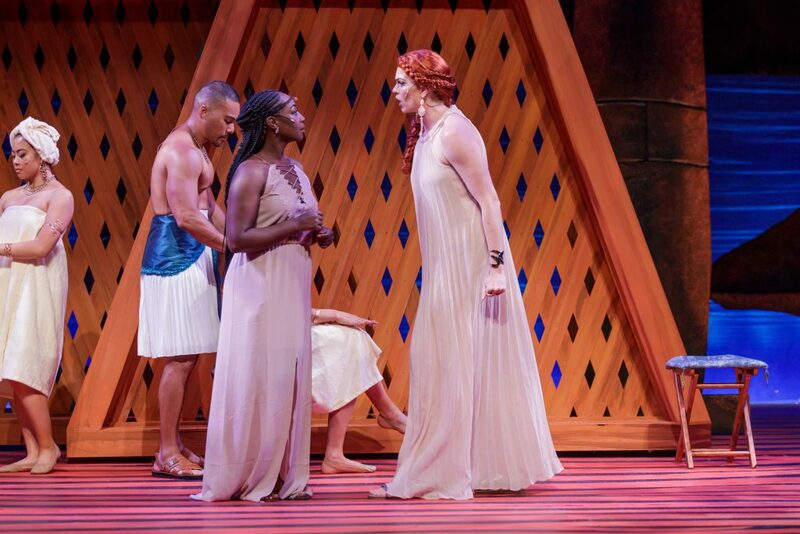 “Aida” features a diverse Nubian and an all-White Egyptian cast, representing the colonized people and their imperial rulers. When Egyptian Captain Radames (rockstar Shaun Leslie Thomas) encounters the Nubian Aida, he makes her his palace slave. In order to save her people she must stay hidden in plain sight. Aida must leave her own people out in the elements while she devises a plan to free them. Even when she has to hide her identity, Aida (stunning Raquel Nicole Jetè) holds herself like royalty. Aida befriends Radames’ betrothed Princess Amneris (hilarious Caitlin McGinty). The lovers get tangled in a thrilling, taboo love triangle, and we soak up the drama, happily. A feeble connection between the actors slows the pace; but when the Ensemble enters, they shake us up. As Radames’ father, Zoser (smiling Benjamin Ball), sings his solo “Another Pyramid,” the militarized ensemble enters in red army sashes and body armor. First-rate choreographer Helfer gives us a mix of martial arts and Jazz dancing—from brilliant Karate punches to dazzling fouettés. Ramades and Aida’s love trumps hateful Egyptian torture as they defy Zoser. Elton John and Tim Rice’s beautiful hymn “God Loves Nubia” brings tears to my eyes. I am reminded that our problem stem from socially inflicted, systemic abuse, rather than the color of my skin. 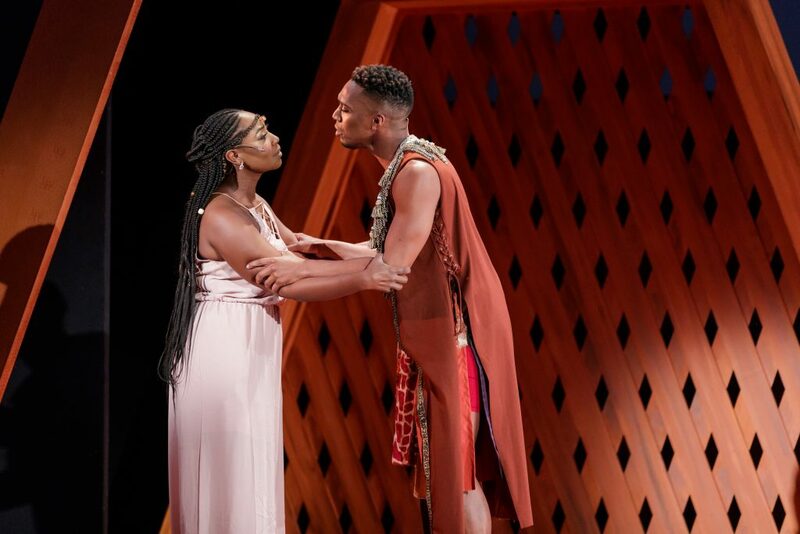 “Aida” reminds us that slavery still exists around us, in the form of relentless commercialism and mass incarceration. We need a leader now more than ever. Perhaps a fierce and compassionate princess like Aida will appear on the horizon. Or, maybe we have to do it, ourselves. Cast: Raquel Nicole Jetè, Caitlin McGinty, Shaun Leslie Thomas, Montel Anthony Nord, Benjamin Ball, Vida Mae Fernandez, Fred Feizollahi, Bernard Polk, Kylie Abucay, Pauli Amornkul, Clint Calimlim, Sofia Costantini, M. Javi Harnley, Alyssa Leonard, Ali Alcer, Neal Pascua, Daniel Lloyd Pias, and Angelica Scott.